time for the results of this weeks tutorial voting. MV's year of the painter 2 is proud to present to you the next article in line. Many thanks to everyone who voted since this Tuesday. We had twentysix votes for "Water Jar" and seventeen for "Boudica". Roman will now take care of the article. Jarhead writing about jars, eh? Well this is not a common article I guess, but in many aspects we all do talk not enough about the water jars we use. 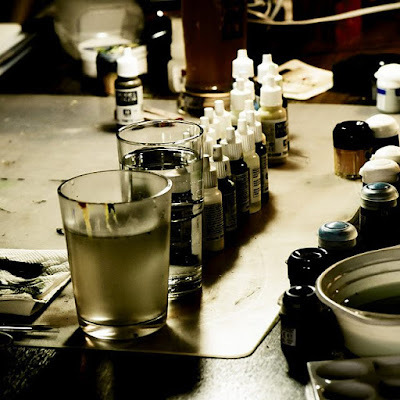 Every Miniature Painter has one, or two or even three. I very often have one, but preparing this article reminded me to at least use two again. Let's dive in the article by having a wonderful example how a workspace with water jars should look. 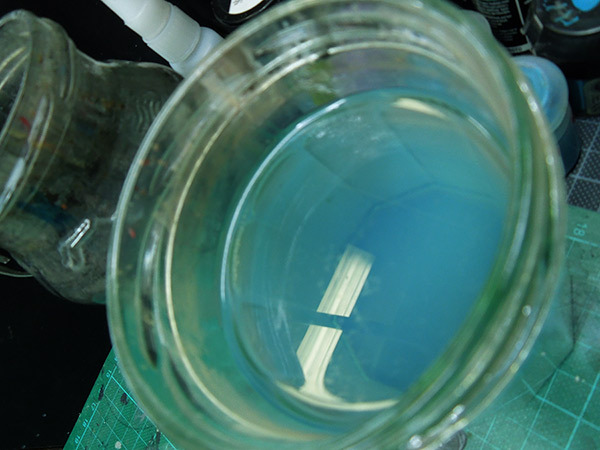 I say perfect example, because you have one water jar for the use of metallic colors, one for normal acrylics and even another one for dirty work if you are in need of water for your use of sculpting putty. The water looks kinda fresh and will definatly help the painter through his project. "I think I'm probably over-doing it, but I use 6 jars. 3 for normal colours and 3 for metallics. Each time I clean my brush, I waggle it in each one in turn. The first jar is filthy, the second looks slightly murky and the third is clean. I also change the water at the start of each session and will sometimes change the water in the first jar part way through a session if it's looking like soup." Very often the reality about water jars looks different. Sometimes they are the black sheep on my own table and I do not care about them too much. I can not tell you even why. I took the opportunity to check the water jars in our studio without telling Bene, Raffa and Erik to see how far away from the perfect example reality can be. My own, ok let's not talk about the clarity of the water. No just don't. Some say it is the black hole on my workbench. Raffa's. Dry as a desert. Erik's. A dark brown black red or something. 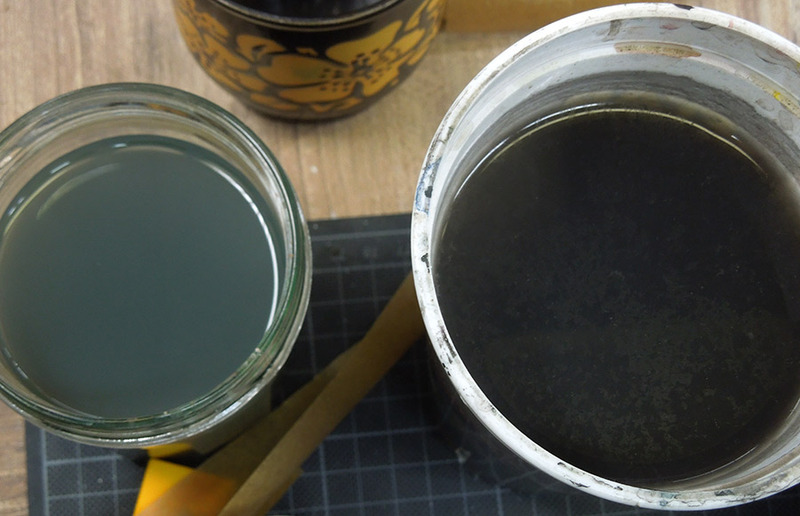 At least Bene is working with two jars, one with a blueish touch and the other one looks like an oil accident. Maybe I should add a sculpture of a dying pelican to it to remind him of health issues. Allright, reality does look different. A lot. Now to collect some information we just gathered. You can use mostly everything you like as a water jar. Glass, plastic cups, ceramic cups, etc. and I know some painters who even have professional equipment as a water jar. They have some separation inside their jar to have all in one, like small different lakes. 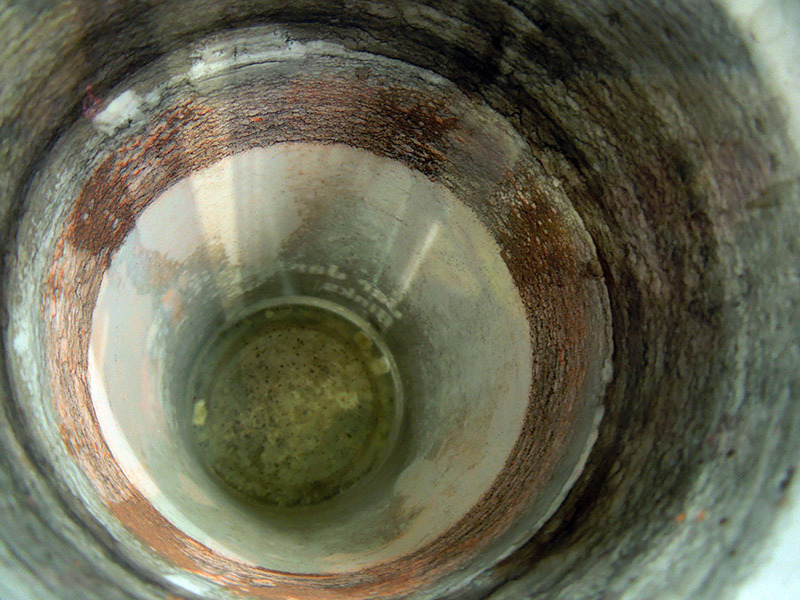 I do not recommend using metall cups or cans as these might rust over time. In the recent examples you can see that most of the cups are filled with dirty water. Some are dirtier than others or have another color or do not have any water, but dirty dust. This happens to all of us as we paint. Some recommend using only destilled water, others put some dish-liquid in it and others just paint with the water that comes out of the water tap. I can only speak for myself here and say I only use the water from the water tap. Usually I do not care about my water when I paint dark shadows. 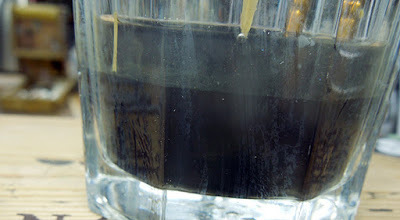 It does not matter if my water looks very dark as I am up to paint dark shadows. But what if I want to paint clear, strong and bright highlights to a miniature? The following example "soup" will definatly influance your bright tone as you are taking out water from here. Even it is only a small percentage of grey that is influancing your color it will definatly make your paintwork more dessatured. 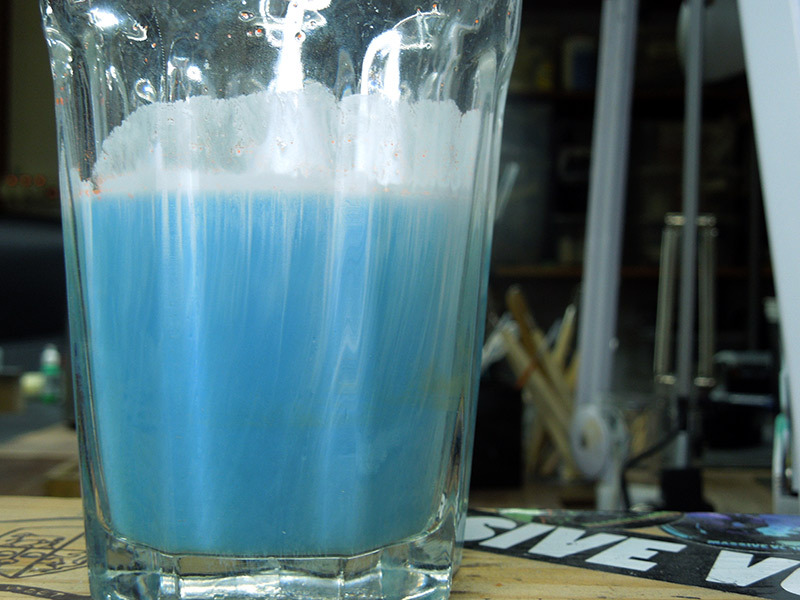 This blueish touch might also take influance on your color that you are painting. Are you a brushlicker or not? If not you are on the safe side of health issues. 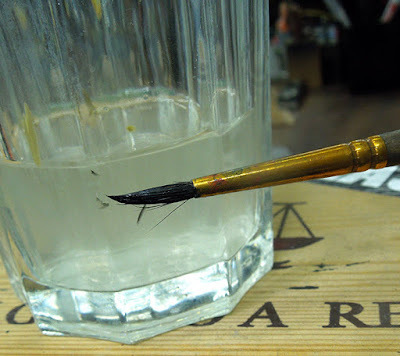 If you do lick your brush once in a while during painting clean water is not only recommended it is a must. See the following example, we got some strange film on top of the water. 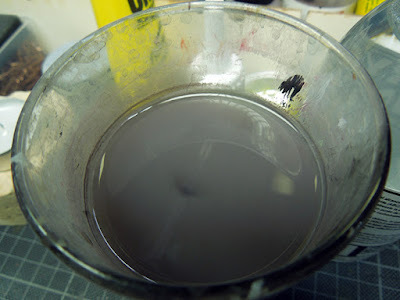 This can be just dust from the room, oily film because you washed out strange and non-acrylic colors, varnishes or maybe it can also be resin dust that Raffa produces in our studio by making moulds and preparing casts. All in all we can say it would not be healthy to paint with this nor lick your brush when you use such water. Oli of the MV team can tell you a story about some health issues he had back some years. He was feeling sick once in a while and did not know the reason. 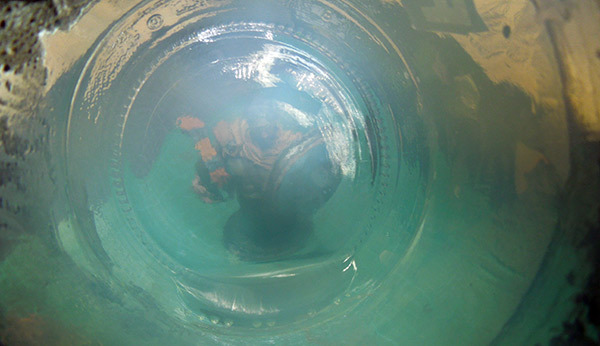 He and a doctor found out that it was because of bacteria inside his painting water. After preparing for this article I do clean my jar at least once a week. Recently it even happens to me that I clean up my jar several times during a painting session. Why? 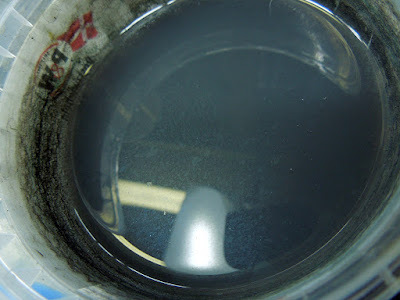 Well, here is a test to show you how quick our painting water gets dirty. Let's say we have some fresh water. 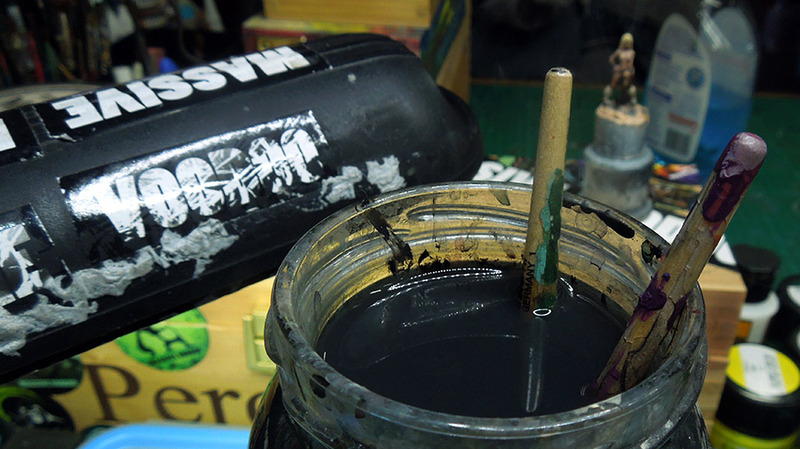 I am now throwing in a brush with black acrylic color on it as I have painted a plinth black. The water quickly goes dark and becomes only water to paint shadows with. This was just done in a second. Now imagine you paint for hours, days, weeks without cleaning your water jar. With every clean up of your brush you bring in remains of color pigments to your water. 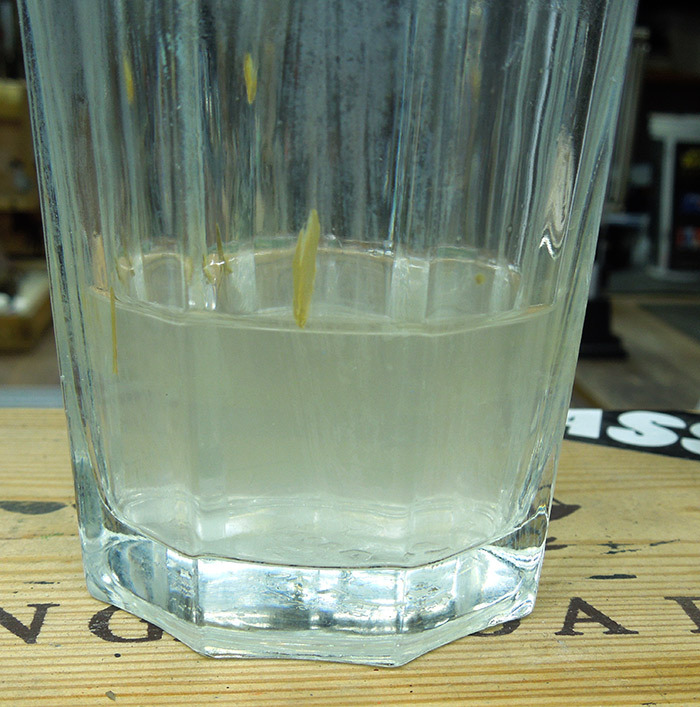 In the beginning they might color up your water, but after a while they settle down and go to the ground. Usually when cleaning your water jar you empty it from water, flush it with fresh water and put some new water in it. The simple and fast way. Sometimes when you paint a lot and do not clean up your jar regularly this is not enough. This is the ground of my water jar when flushed out. 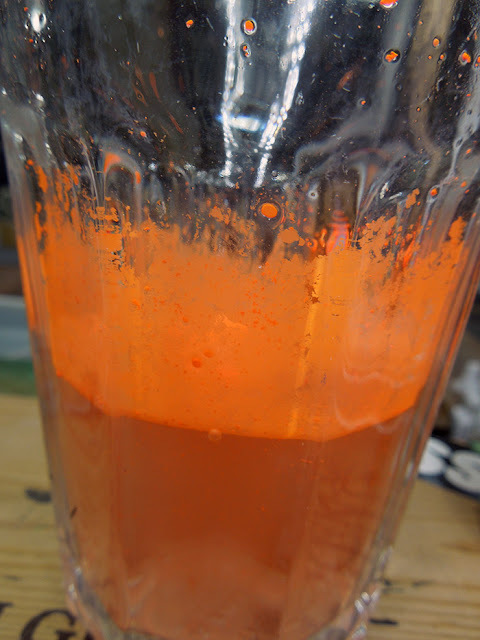 I call this pigment mud and it was swimming in my painting water, the water I put in my colors to mix, the water that is inside my brush when I lick it. Unhealthy, yes. I have a friend - telling no names here - who was thirsty and really lazy to get a drink so he drank some of his painting water. He is still alive, but after the following photo I know I would never do it myself. I really have to clean it properly, not only the bottom of the jar also the sides. You can see small pigment mud pieces everywhere. If I just clean the bottom and put fresh water in it I will have these pieces swimming around freely, ready to get mixed in my colors and ready to be painted to my miniatures. Cleaning it properly is essential. You can do this with a sponge, tissues or a towel. Once in a while you can even put your jar into the dish-washer. Essential to your health and paintwork. 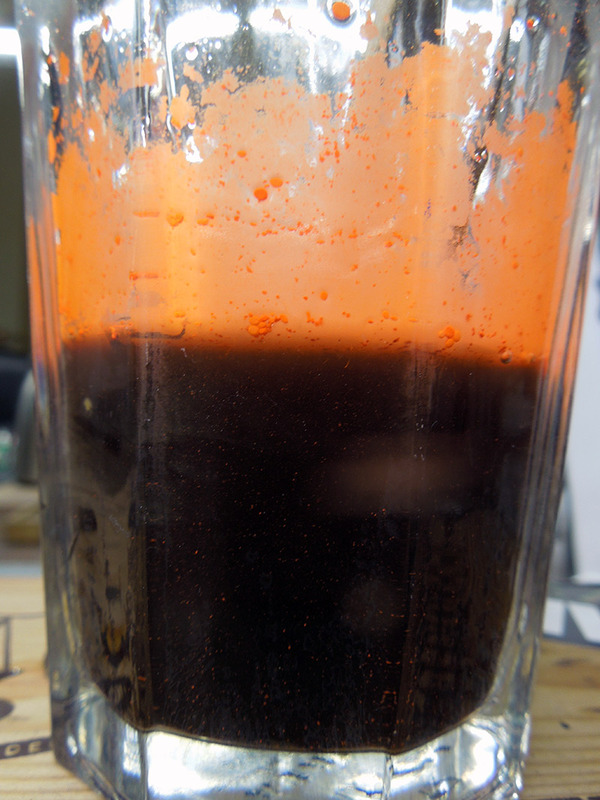 For example I also use two jars once in a while, when I paint a lot with metallic colors. The reason is simple. 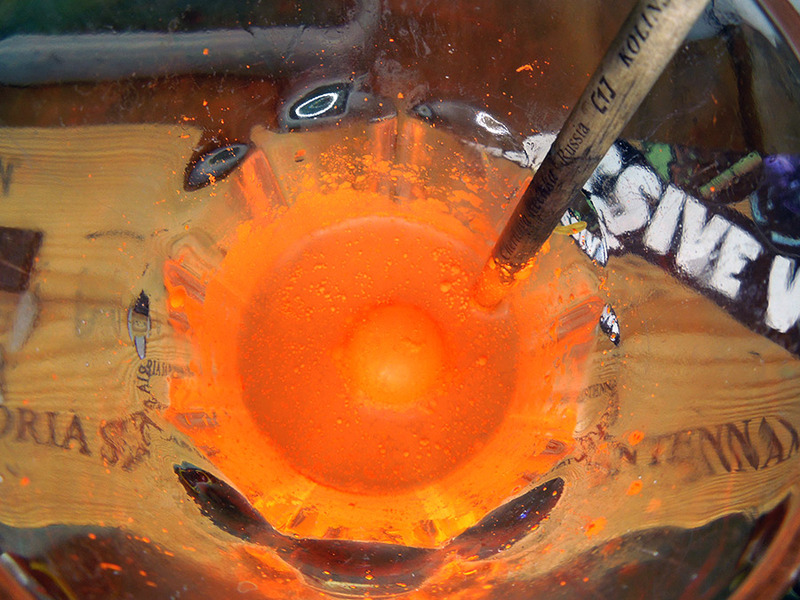 If I clean my brush with metallic pigments the water will get filled up with metallic pigments. If I use the same water again for painting skin my miniature might have some metallic shine in his skintone. If you like it you can do it, if you don't, don't. I used the jar with the lid for my metallics so I can remind myself of it, but well a lid is not a good idea I have learned. Somehow I had mould on the bottom side of the lid rather quick. I am no biologist but this made me never us that jar nor a jar with lid again. Really it looked like strange alien stuff. Use no lid! 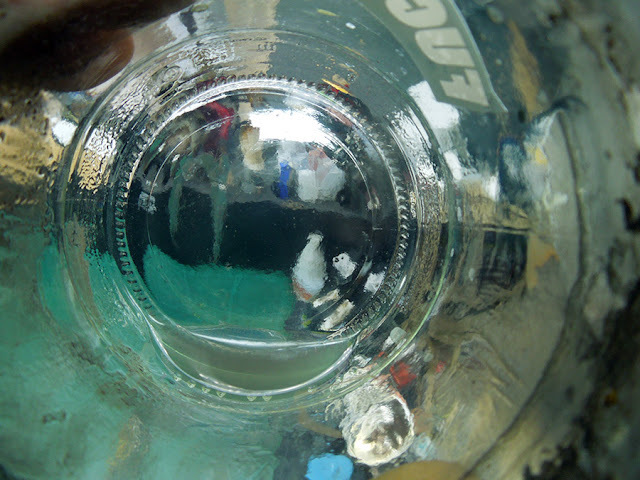 As you can see on the upper photo I do not care too much about the outside of my jar, but that is presonal preference. My water jar is loosing water over time? You are right and that is very easy to explain: It's open and water evaporates slowly and additional to this everytime you put your brush in you take out some water. So this is not a bad issue and you can not help it. 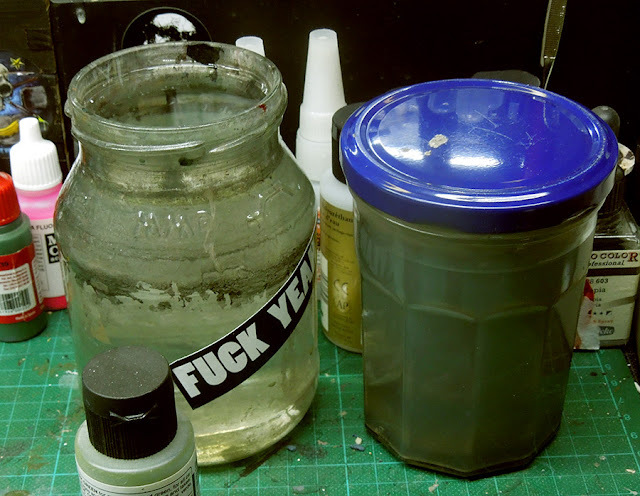 Well, so far this is all I can tell you about a miniature painter's water jar. I really had my fun creating this basic topic article, but I think it is has some valuable information. 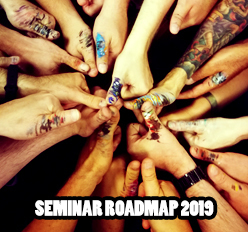 - let me know your thoughts, ideas, experiences and tips via comments! Hahahaa.. this is a great article.. really made me laugh at the comments behind the photos, and the reasoning for them. 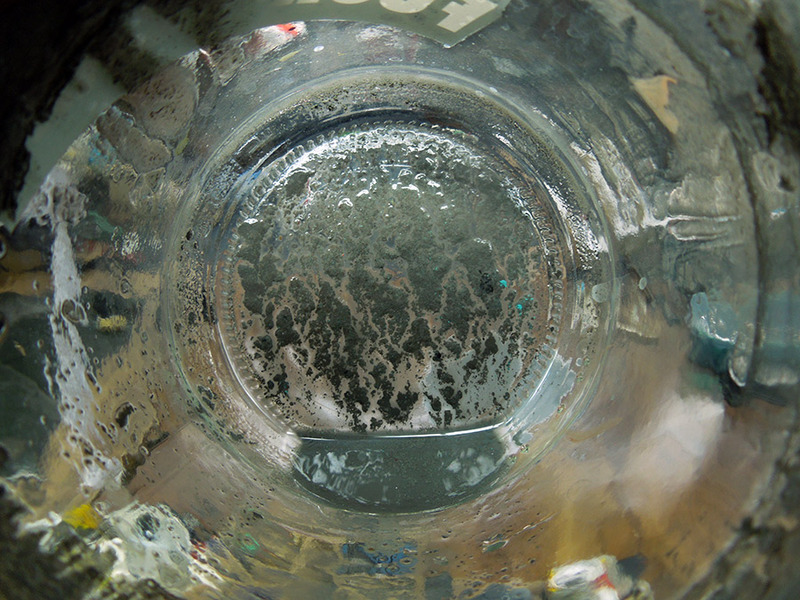 Lots of reasons to clean your jars more often, with the underlying message being.. keep it clean and paint with clean water as much as possible.. be it for cleaner/brighter paint results, or just because of your health! I empty and flush my two cups after each painting session. Mostly because it's easier to store them empty. And my metallic cup is marked with an old and dirty paper-tape with the "METALOCALYPSE" word on it. And I was kinda surprised at the notion of licking the brush. BTW, about dirty water for chading: a while agow I was painting some dungeon tiles for d&d and after priming them black I used the tar-pitch-black water as the base for some quick wash, just added some brown, PVA glue and dish-washer. Two cups here. One with dirty water in which I stir the brush a few times before drying in a paper towel and then I stir it in the "clean" water pot before drying on the towel again. I change the water once a week or more often when using metallic paints. I have more than one cup. One for painting, one with fresh water and one (or more) for sculpting. I clean my pots (= fill them with fresh water) before I go to sleep. I change the water in the sculpting about once a month. 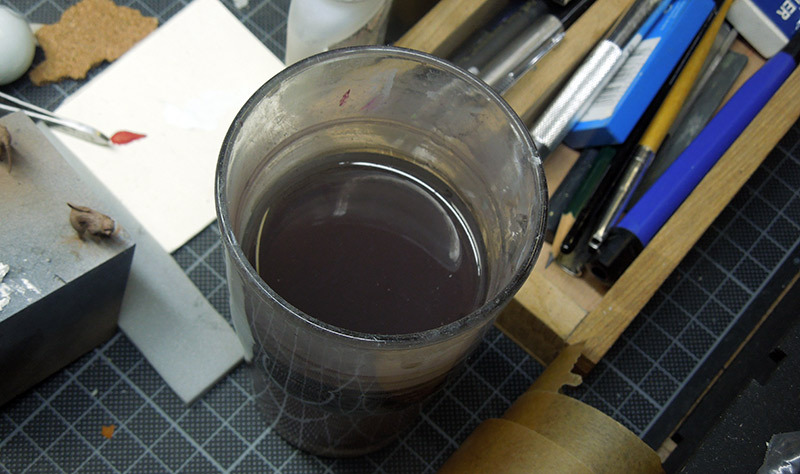 If I use metallic colors, I clean it after I use any single color and very often I even clean my brushes under flowing water, too. I have never ever imagined water jars could have been a topic. Well, it is good to talk about it. I always neglect my water jar, but looking to discipline myself with two jars. Once for cleaning and one for mixing. My water jars are old ink pots because they have a thicker bottom to stop them from being accidently knocked over. Bit on the small size, but I change the water regularly. I find that I have to use lids, otherwise I come back to a sort of small insect soup... never had any mold problems which is strange now that I think of it. Maybe I had the mold problems cuz I am a brushlicker, really no idea, but good for you! Pink rules! I think I'm probably over-doing it, but I use 6 jars. 3 for normal colours and 3 for metallics. Each time I clean my brush, I waggle it in each one in turn. The first jar is filthy, the second looks slightly murky and the third is clean. I also change the water at the start of each session and will sometimes change the water in the first jar part way through a session if it's looking like soup. Hey Steven, no that is spirit about Water Jars. Love it and included it in the article. Wow, thanks man. Your blog has always inspired me - I now feel even more inspired. Love the pics! I like the "peek" into your artist's studio and comments. Really, what's to say about rinse jars besides to say "have two of them" and "don't mix metallics with regular paints"? Myself, I just reuse plastic cups and containers (don't forget the plastic containers for roasted seaweed snacks, too! 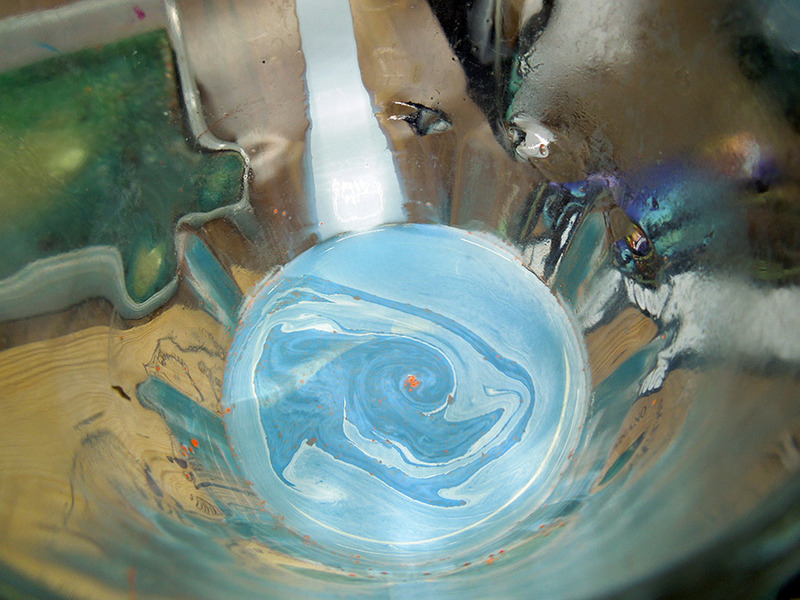 ), then use a new cup after I do a batch of painting with metallics.